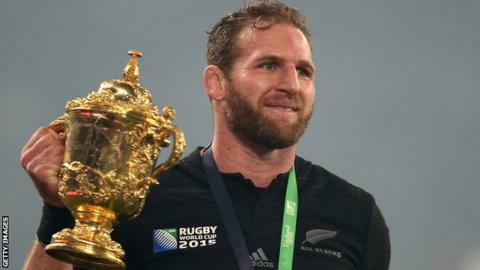 New Zealand captain Kieran Read will retire from international rugby union after this year's World Cup in Japan. The 33-year-old has 118 caps for the All Blacks, including just 14 defeats, and has helped his country win the World Cup in 2011 and 2015. Read will leave the Crusaders to join Toyota Verblitz in Japan next year rather than move to a European club. "Japan's a bit closer to home than Europe and probably a bit easier on the body as well," said the number eight. "They brought me in not just to play but also to mould their team and use all the experiences I've had in trying to help them out." Read made his international debut against Scotland in 2008 and took over the All Blacks captaincy when Richie McCaw retired after the 2015 World Cup. He led the All Blacks in the tied series against the British and Irish Lions two years ago. Read said he made the announcement to retire from the international game so he could concentrate on the Super Rugby season and the World Cup. "Knowing it's my last opportunity, I'm very motivated and can't wait to get into it," he said. "It's an exciting time." All Blacks coach Steve Hansen added: "He's developed into a fantastic leader who has the utmost respect of all his peers. "What he has achieved has been remarkable, and it's fair to say that he is one of the greats of our game."